Family time may not be the first thing that comes to mind when you think of terrifying downhill runs like Corbet’s Couloir in Jackson Hole, Wyo., Highland Bowl in Aspen, Colo., or the Big Couloir at Big Sky, Mont. This is precisely why so many ski destinations celebrated for their daredevil Instagram feeds are ramping up features to better engage and excite families with beginner skiers — on the slopes and off. Among the new features on tap at marquee resorts this winter: expansive learning parks featuring adventure trails and wide, gently sloping landscapes with snow props that help first-timers learn the fundamentals of the sport, family-focused mountain lodges and expanded ski-school offerings for toddlers and teens. The kid-friendly alpine adventures continue when the lifts close with apres-ski offerings including ice skating, rock climbing, s’mores-making and open-air sleigh rides. Here’s a rundown of the season’s new additions. Though the alpenglow of 14,000-foot peaks is this resort’s calling card, Aspen Snowmass — which is composed of four mountains: Buttermilk (green), Snowmass (green/intermediate), Aspen and Highlands (both steep black terrain and backcountry ) — is also a terrific spot for beginner skiers. This season, it will expand its signature Terrain Based Learning for the 6-and-under set with sculpted snow features designed to introduce spatial awareness and rudimentary skills (stopping, turning, balance) with props. Translation? Curved walls, controlled wave tracks and wee halfpipes allow beginners to practice starting, stopping sliding and balance. Once the gentle green runs of Buttermilk are conquered, students move to the more challenging terrain at Snowmass where instruction progresses in the same prop-based vein. For preteens (8-to-12) looking for camaraderie and carving skills, a new small-group program, Kids Mountain Explorers, is a week-long adventure camp tackling all four mountains with the same crew of kids (depending on the group’s ability level). On the hospitality front, the about-to-debut Limelight Hotel Snowmass is a dream for parents who crave sophisticated digs minus the pressure to constantly shush their brood. In the heart of Snowmass Village (with its celebrated apres-ski s’mores cart), the 99-room ski in/ski out property’s top-drawer amenities — two pools, an outdoor skating rink, a five-story indoor climbing wall, a lobby and restaurant with a bean bag chair-studded game area and a ski valet — are the definition of family fabulous. Aside from being home to Birds of Prey, the acclaimed downhill, super-G and giant slalom men’s World Cup tour race, the Beaver Creek Resort — which famously serves hot cocoa at chairlifts and just-baked cookies at the mountain base each afternoon — has been burnishing its reputation as a family destination for some time. Building on last year’s debut of Red Buffalo Park, a 200-acre, 13-trail family adventure zone for intermediates, comes Haymeadow Park, a learning terrain focused on the beginner experience. The new space includes Smarte Terrain, the sculpted runs that allow skiers and snowboarders to hone skills such as speed control, turning and carving. There also will be a gently sloping introductory racecourse to instill confidence in pint-size daredevils. In addition to having its own gondola and magic carpets (surface lifts for beginners that are like moving walkways on snow), the Ranch — the ski school’s kids-only restaurant — will unveil an ice cream parlor specializing in nostalgic sweets. Another perk for families: After the lifts close, the village of Beaver Creek, as in seasons’ past, will offer apres-ski programming that includes outdoor, big-screen movie nights, fireside readings of classic stories, demonstrations by snow and ice artists and ice skating. Lone Peak’s 4,350-foot vertical drop can strike fear into the heart of the most seasoned skier. But not all of the Big Sky Resort’s 5,800 skiable acres require avalanche gear. In fact, 2,300 acres are dedicated to beginner and intermediate terrain, with wide, groomed runs and “predictable pitch” — otherwise known as easy terrain. In 2018, the resort installed four new magic carpets to better service the green areas that include Chet’s Knob, a terrain-based racecourse for beginners, and Kidzone, gladded runs where novices can gain experience weaving through trees. In tandem with these improvements, the resort has added to its ski school offerings with Small Fry Camp, a 1½ -hour lesson designed to get 3-year-olds on skis and Teen Mountain Experience, a small-group, half-day guided lesson to build skills and encourage bonding with fellow would-be shredders. (After the lesson, kids can be dropped off at the Lone Peak Playhouse, a child-care center affiliated with the resort, so parents can make a few extra runs.) Chet’s, the resort’s tavern-style eatery in Mountain Village, has been entirely revamped this season with an eye toward the family apres-ski and early-bird dining experience. It offers a kids menu featuring bacon mac and cheese, bagel pizza and huckleberry barbecue wings, as well as board games (playing inside a massive teepee, optional) and supervised s’mores- and gingerbread house-making. High in the Wasatch Mountain Range, not far from the lift for one of the Park City Mountain Resort’s most extreme black runs, the 9990, is High Meadow Park, the resort’s newly reimagined learning area. Its wide swaths of gently sloping beginner terrain are made decidedly more thrilling by the fact that the area is located mid-mountain (compared with the blah mountain base to which the majority of green runs are relegated) and has spectacular views. The expanded teaching area has another fun element: three adventure trails (gladded runs with a controlled, easy-to-navigate pitch) through a small forest with wooden animal sculptures hidden in the trees — a feature that improves skills while delivering the feel of back country skiing. Kids don’t need to go far for hot chocolate breaks: The learning area is adjacent to Red Pine Lodge’s grab-and-go restaurant, whose wraparound outdoor deck is the perfect spot for meeting up with parents for lunch. Last season’s $15 million infusion to the Grand Summit Hotel at the base of Canyons Village made this ski in, ski out lodge (steps from the ski school) a favorite of parents who want roomy suites and minimal schlepping of gear. Jackson Hole Mountain Resort boasts some of the steepest backcountry skiing in North America. Less well-known are its amenities for newbie skiers. This season, Solitude Station Learning Center, a new 12,000-square-foot facility just minutes from the base and smack in the middle of the recently extended Antelope Flats, a network of green-only runs, will shine a spotlight on the beginner experience. 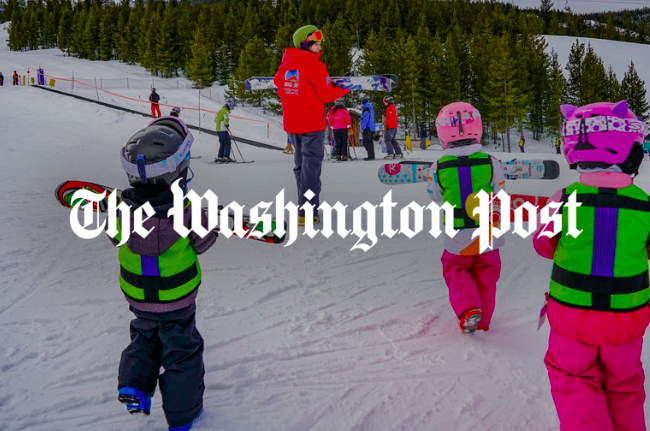 It will offer gear rental, lift tickets and ski school drop-off under one roof (previously this was a chaotic, multi-stop endeavor) — a boon for parents trying to hustle their kids to ski school before hitting the slopes themselves. The airy, wood-accented lodge will have two cafeteria-style restaurants (with separate areas for adult and kids’ ski school students), a game-changer for non-advanced skiers who, in seasons past, had to descend all the way to the base for lunch. The lodge’s floor-to-ceiling windows and viewing deck, complete with fire pits, offer parents an ideal vantage point from which to watch their children begin to cruise. 7680 Granite Loop Rd., Teton Village, Wyo. A luxurious, ski-in/ski-out accommodation with a ski valet, an outdoor pool and a wraparound lobby deck with fire pits for nightly s’mores-making. Rooms from $482. 141 Scott Hill Rd, Avon, Colo.
A newly revamped 60-room ski-in/ski-out lodge with spacious chalet-style condominiums, an outdoor pool, ski storage and an excellent restaurant, the Grouse Mountain Grill. Rooms from $149, if booked by Nov. 1; starting at $185 thereafter..
750 Lone Mountain Ranch Rd., Gallatin Gateway, Mont. Upgraded, historic cabins surrounded by an extensive Nordic trail system. Also on offer: sleigh rides, dog sledding and snowshoeing. Rates from $329. 65 Wood Rd., Snowmass Village, Colo.
A brand new, 99-room, ski-in/ski-out hotel with two pools. There are kids’ play areas in the lobby, as well as climbing wall, a skating rink, a ski valet and daily apres ski snacks. Rooms from $525. Just steps from the ski school meeting point at Canyons — Park City’s beginner terrain — is this recently renovated property, which offers roomy suites, an outdoor pool and convenient ski storage. Rooms from $323.